Although many attractions, offices, businesses, and governmental agencies will be closed on Labour Day, there are still plenty of events and things to do over Labour Day weekend in Montreal. In 2018, Labour Day weekend takes place from Friday, August 31 through Monday, September 3. Often considered the last summer weekend of the year, Labour Day weekend is one of the most popular times to visit Montreal. No matter what your interests, you're sure to find some way to enjoy the holiday weekend—from sharing a delightful summer brunch with friends to attending a one-of-a-kind parade. Whether you're staying in the heart of downtown Montreal or plan on heading out to one of the nearby beaches, be sure to check out these great events and things to do before you visit the city. Also, if you plan to stay in Montreal throughout the month, there are plenty of free things to do this September as well. While available year-round, some of Montreal's best brunch spots offer discount prices all weekend long in honor of Labour Day. Additionally, some restaurants that open specifically for the holiday itself offer special lunch and dinner menus with limited or seasonal options. Some restaurants will even allow you to linger on their terraces throughout the day, enjoying multiple meals at your leisure. 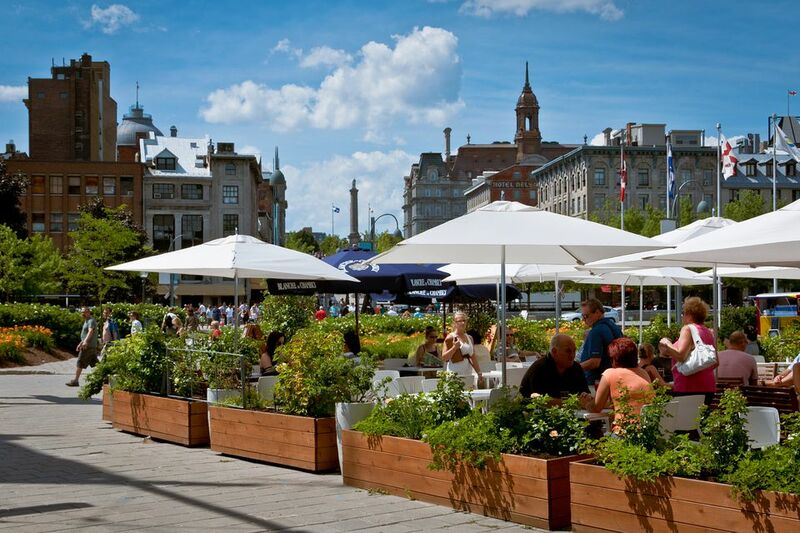 If you're looking to squeeze a bit more rest and relaxation into your extended weekend, visit one of the best Montreal terraces for an afternoon snack or early evening dinner. If you'd rather grab some local produce and pack a picnic lunch to take to the park, you could head to one of Montreal's major public markets like the Jean-Talon Market. These public shops are akin to American farmer's markets and offer a wide variety of fruits, vegetables, cheeses, meats, and eggs for purchase. Although Labour Day may be a little early for some autumn crops, apple picking season officially starts over the weekend and there are plenty of lovely orchards scattered in every direction from Montreal, many of which are not too far away. To the east and southeast of the city, you can head to Au Paradis des Fruits in Dunham, Au Coeur de la Pomme in Frelighsburg, or Verger du Flâneur in Rougemont. To the north and northwest of the city, you can check out Les Vergers Spénard in St. Eustache, Jude Pomme in Oka, and Les Fromages du Verger in St. Joseph du Lac. Although the event suffered some bad press in 2016 when much of the festival's staff resigned a few weeks before the event resulting in multiple screenings being canceled, Montreal's World Film Festival is possibly the most prestige-laden festival in the city now that it's recovered under new management. The 42nd Annual event will take place from August 23 through September 3, 2018, with features, workshops, and awards to be announced closer to the date. Each year over 400 films from 80 countries compete in the Montreal World Film Festival, including feature-length world premieres, short films, documentaries, and even some animations. The Montreal Gay Village's summer events and activities are in full swing on Labour Day weekend, including both a fashion show and a sidewalk sale. While you can enjoy the festive, jovial atmosphere of the closed-to-cars pedestrian walkway created just for the season in the middle of Sainte-Catherine Street all summer long, Fetish Weekend takes place from August 31 to September 3, 2018. The season for summer sidewalk sales winds down come September, but two of the season's biggest sales take place over Labour Day Weekend: the Gay Village and the Hochelaga-Maisonneuve summer street fair finale. If you're planning to visit the latter, you can pair your shopping adventure with a trip to the nearby Biodome, Montreal Botanical Garden, Insectarium, or Planetarium. Alternatively, you could spend the day cruising around some of the Montreal cycling hot spots along the waterfront instead. Since the first award in 1955, World Photo has become one of the most important events and exhibits in the field of photojournalism. The World Press Photo exhibit will return to Montreal from August 29 to September 30, 2018, for the thirteenth edition of the show at the Bonsecours Market. This special exhibit features the winning works for one of the biggest photo contests in the world, and this year, over 4,500 photographers from 125 countries submitted a total of 73,000 images for the competition. Started in 2017, the Électro Parade Montréal was the first of its kind in North America and is expected to return over Labour Day weekend in 2018. Hosted by evenko and MEG Montreal, the Electro Parade features local and international DJs on parade floats blasting electronic beats to the countless dancers around them. Although the lineup for 2018 has not been announced, you can expect artists who are similar to those featured in 2017 like Agoria, Anti Anti, Boho Soundsystem, Cerise, Claire, Clyde P, The Holy, and TIZI. The event is free to attend and takes place in downtown Montreal on the Saturday of Labour Day weekend from 11 a.m. to 2 p.m.
Another great way to catch some electronic music, Piknic Electronik is Montreal's favorite Sunday rave in the park, which usually proposes not just one but three back-to-back Piknic editions every Labour Day weekend. Taking place at Parc Jean-Drapeau from Saturday, September 1 through Labour Day Monday, September 3, 2018, you can expect a full line-up of some of the best DJs from Montreal, Canada, and around the world. Be sure to bring plenty of water, a picnic blanket, and some snacks in case you get hungry while dancing to the beats. Head out to the angel statue at Parc Mont-Royal anytime after noon on Sunday, September 2, 2018, and you'll be sure to hear the distinctive drumming of the Tam Tam, one of Montreal's favorite weekend activities. Guests are welcome to bring their own drums to join in this traditional drum circle, but you can also just attend to dance, converse, sing, and be part of the experience. While it's not common that Montreal experiences much rain over the holiday weekend since August and September are among the city's driest months, a sudden shower might send you running for shelter and something to do inside. Fortunately, many of Montreal's famous museums, galleries, and concert venues are open over the Labour Day weekend and holiday. You can enjoy a touch of high tea at a Montreal salon before heading to the Montreal Museum of Fine Arts for a day of ancient history and modern art, or you can catch a movie at one of the city's many theaters before spending the day shopping in Montreal's underground city or gambling your money away at the Casino. If music's more your preference, everyone from mainstream pop stars to underground hip-hop, indie, and EDM artists will be performing all weekend long. Be sure to check out the full list of September concerts to see if your favorite musicians will be performing over the holiday weekend. If you're more of a thrill-seeker and want to spend your Labour Day weekend in Montreal at an amusement park, the only place in the city with all the thrills is La Ronde. Featuring some of the best roller coasters in Canada, including the virtual reality experience on the hypercoaster the Goliath, which reaches a g-force of 4G, La Ronde is Montreal's biggest tourist attraction. Additionally, Labour Day weekend is one of the busiest weekends of the summer season, so be prepared for long lines and big crowds if you decide to visit the amusement park during your holiday vacation.